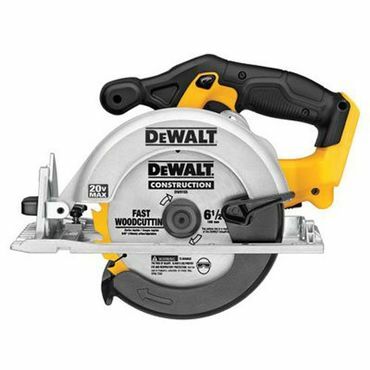 When it comes to circular saws, DeWalt models are Best Reviewed in every category -- corded, cordless and worm drive, but we found some competing saws worth considering. We also offer pointers to help you make sure you find the right circular saw for your project, skill level, and budget. 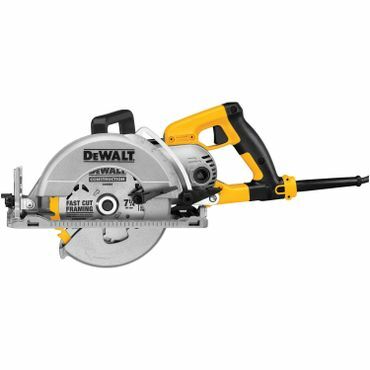 The DeWalt DWE575SB is one of the lightest circular saws you can buy, yet it still delivers plenty of power. Professional testers give it high marks not just for cutting performance, but also for its handling and dust removal. The saw is solidly built, with a cast-aluminum shoe and a heavy-duty cord. It's a bit light on features, though: It has a blade brake, but no rip fence, laser guide, or work light. The DeWalt DCS391B cordless saw gets high marks from both professional testers and home users. It's quite light – about 7 pounds without the battery and 8.5 with it – yet still very powerful. Reviewers are impressed with its stable base, cut-line markers, 50-degree bevel setting, and blade visibility. They warn that it runs through smaller batteries fast, but with a larger 4.0 or 5.0Ah battery, it can go quite a while on a charge. For those who need the power of a worm-drive saw, the DeWalt DWS535 is the best overall performer. It's fairly light in weight for a worm-drive saw (though still quite a bit heavier than a sidewinder), and its sturdy foot plate, accurate bevel and depth guides, and snag-free blade guard all win praise from professionals and users alike. Accessories, including the well-designed rafter hook and optional rip guide, come in for praise as well. Most circular saws are "sidewinder" models, which have the motor mounted perpendicular to the blade. This design places the motor and handle assembly to one side of the blade – usually the right side, but some saws have it on the left. Sidewinder saws can be corded or cordless. Because it's not tethered to a power outlet, a cordless circular saw is more versatile, allowing you to take the tool to the job instead of the other way around. For example, trimming the deck of a tree house with a cordless circular saw is a far easier job than trying to drag an extension cord up the tree, and no matter where you are working, you don't have to worry about cutting the cord. Unlike sidewinders, in-line saws place the motor and handle in line with the blade. They're often known as worm-drive saws, because they typically use worm gears – toothed wheels worked by a short, threaded cylinder, or "worm" -- to drive the blade. However, some in-line circular saws are driven by hypoid gears, a complex type of spiral bevel gear, and are known as hypoid saws. Each type of circular saw has its own set of advantages and disadvantages. Corded sidewinder circular saws are more compact than worm-drive saws, and they're also lighter, ranging from 8 to 11 pounds. Many users, including This Old House master carpenter Norm Abram, find them better balanced and more maneuverable. And they're generally less expensive, usually costing between $100 and $150. Worm-drive saws, by contrast, are typically heavier – between 12 and 15 pounds – and pack more power. Professional framer Tim Uhler, writing for the Journal of Light Construction, says he prefers this type of saw because it's "more durable and less likely to bog down in heavy cutting." Worm-drive saws are also a bit more expensive, ranging from $125 to $225. Which type is better for you depends on your strength, your work style, and how much heavy-duty cutting you need to do. Cordless circular saws have improved dramatically in the last several years. They've grown both larger and more powerful, and lightweight and long-running lithium-ion batteries have taken the place of the heavier nickel-cadmium type. However, cordless circular saws still can't quite match the power of their corded cousins, and although battery life has improved, they still have limited run times. A cordless circular saw can also cost more than a corded saw because you have to invest in the battery and charger, which adds anywhere from $100 to $250 to the price of the tool. However, if you already own a cordless tool from the same manufacturer, you can purchase the "bare tool" for use with your existing batteries and charger at about the same price as you'd pay for a corded circular saw. "Best Circular Saws of 2018"
"Tool Test: 18v Cordless Circular Saws"
"What's the Best Circular Saw?" To find the best circular saws, we consulted professional comparison tests in tool-centric publications such as Fine Homebuilding, the Journal of Light Construction, Family Handyman, and Popular Mechanics. These tests evaluate circular saws' cutting power, accuracy, features, and ease of use, as well as battery life for cordless models. Owner reviews from retail sites like Amazon and Home Depot help fill in the blanks as to how typical users view their saws, sometimes after months -- or more -- of use. These real-world reviews address things that sometimes crop up only after the kind of extended use that's beyond the scope of most expert evaluations. Based on these sources, we've named our top picks for corded and cordless sidewinder circular saws and worm-drive saws, with recommendations for any type of user, job, and budget. Most corded circular saws are "right-bladed" sidewinder types, meaning that the motor is mounted to the left of the blade. This keeps the handle and heavy motor on the supported part of the board, but it also partially obstructs your view of the cutting line. "Left-bladed" circular saws usually give a clearer sightline (and are better for left-handed users), but they can be more awkward to handle, since there's nothing to support the heavier part of the saw on the cutoff side of the piece. They also expose a right-handed user to sawdust thrown off by the spinning blade. No corded sidewinder saw earns more consistently positive reviews from both professional testers and owners than the DeWalt DWE575SB (Est. $125). This 7.25-inch, right-bladed saw is lighter than most, at just 8.8 pounds, yet reviewers say its 15-amp motor packs plenty of power. Despite being the slowest-spinning saw tests at Top Ten Reviews, at 5,200 rpm, it rips through both plywood and 2x stock quickly and easily. It also earns perfect scores for handling and dust removal. The saw has a bevel capacity of 57 degrees, with stops at 45 and 22.5 degrees. Handy features include a blade brake, spindle lock, and onboard wrench storage. The DWE575SB isn't covered in any other professional tests, but the similar DeWalt DWE575 (Est. 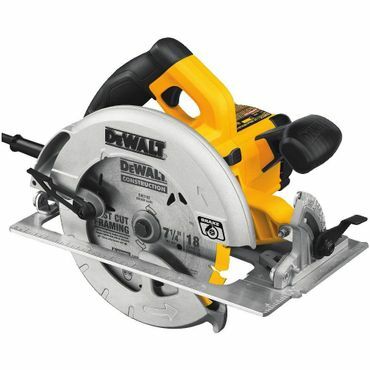 $120) – essentially the same saw without the blade brake – does very well at Popular Mechanics and Family Handyman. Reviewers say it's very comfortable to handle and noticeably quieter than other saws. They also mention its solid construction, with a cast-aluminum shoe (as opposed to flimsier stainless steel) and a heavy-duty 9-foot cord that stands up to rough handling. However, they also note that this saw skimps a bit on features. It doesn't come with a rip fence, laser guide, or work light, and there's no outboard lever for depth adjustment. Also, DeWalt provides only a soft storage bag rather than a hard case, to many users' annoyance. We found around 500 total reviews for the DeWalt DWE575SB at Amazon and Lowe's, with overall ratings of around 4.5 stars out of 5. Owners describe the saw as powerful, yet lightweight, quiet, and easy to handle. They also say its cuts are both smooth and accurate, and they appreciate the blade brake and dust blower. The main complaint we encountered on both sites is that on some saws, the blade is not properly aligned with the base, making it impossible to make a straight cut. If you get a model that's defective in this way, you can take advantage of DeWalt's three-way warranty, which allows returns within 90 days and covers repairs for three years, with free service for the first year. If you're looking for a bit more capacity and better features, the Makita 5007MGA (Est. $175) is a great choice. At Top Ten Reviews, this saw can't match the cutting performance of the DeWalt DWE575SB, but it's still named as a top pick because of its "overall great design." Reviewers say this 10.6-pound, right-bladed saw is powerful, with a 15-amp motor that whips through wood at 5,800 rpm. It's also well-balanced, easy to maneuver, and comfortable to hold, and its 7.25-inch blade "makes exceptionally clean cuts and saws at nearly any angle you'll need": up to 56 degrees, with stops at 22.5 and 45 degrees. Michael Springer of Fine Homebuilding also praises the Makita 5007MGA for its comfortable, rubber-coated grips, dual LED headlight, and flat, stable base plate. However, he also complains that the blade guard tends to stick and the stops have a little too much "slop" for his taste. The Makita includes the blade brake and dust blower found on the DeWalt, plus some extras it lacks: a pair of built-in LED work lights to illuminate the blade, a rip fence, and a rigid carrying case. On the downside, its warranty is only good for one year, and Makita doesn't offer as many options for contacting customer support as DeWalt. Users at Amazon give the 5007MGA high overall ratings, saying it's powerful, lightweight, and manages dust well. However, we saw a few complaints from users whose saws had defects that prevented it from making a straight cross cut. If you end up with a lemon like this, return it quickly; Makita's warranty is only good for one year, and you can't contact customer support via e-mail or chat. If both these saws are a little out of your price range, the SKIL 5280-01 (Est. $65) offers a good, low-budget alternative. This 7.25-inch, right-bladed saw weighs just 8.7 pounds, yet packs a surprising wallop for its size. It has a maximum speed of 5,300 rpm and can cut boards up to 2.4 inches straight-on and 1.9 inches on a bevel. Its bevel range is 51 degrees, with just one stop at 45 degrees. Top Ten Reviews singles out this the SKIL saw as a great overall value. While it can't rival the Makita's superb design or the DeWalt's excellent cutting features, it gets good scores across the board. Editors say it's lightweight and easy to use, and it does a better job removing sawdust than most other saws. It doesn't have a rip fence or a blade brake, but it does include a laser cutting guide, a feature not found on either the DeWalt or the Makita. It also has a spindle lock that makes changing blades easier and safer. Users at Amazon back up these views, awarding this saw 4.5 stars out of 5 in over 275 reviews. Their main complaints are that the stainless-steel base plate is flimsy and the laser guide isn't very accurate.